90 points from Stephen Tanzer's IWC for this beautiful Adelaide Hills Chardonnay: "Greenish straw. Smoky, lees-accented orange and white peach aromas display exotic nuances of bacon, dried flowers and minerals. Chewy pit fruit flavors are dense and ripe but nicely braced by energetic minerality, which carries through the long, juicy finish. Gains weight on the back without losing focus. This is drinking beautifully right now." 90 points from Robert Parker's Wine Advocate: "The 2006 Evangeliste Reserve Chardonnay saw one-third of the wine aged in new French oak for 6-7 months with no malolactic fermentation. 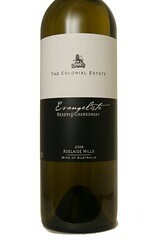 It is light gold colored with toasty, tropical aromas, particularly pineapple. Broad on the palate with adequate acidity, the wine offers some finesse as well as ripe, tasty flavors and a medium-long finish."